Think about climate change, and you may picture melting ice caps and stranded polar bears. But you should also picture a reef-destroying lionfish, voracious Burmese python, or disease-spreading Asian tiger mosquito. As seasonal cycles shift and ecosystems are thrown off balance, those invasive species — and many others — could infiltrate a broader range of territories with devastating consequences to our health, vital habitats and industries. A species is considered invasive when it moves into an ecosystem that has not evolved to control it. Once a species gains a foothold in territory without its natural predators, it multiplies and eventually takes over. This is not a new phenomenon. According to the Convention on Biodiversity, 40 percent of all species that have gone extinct over the last 400 years have met that fate at least in part due to invasive species. However, climate change has already started to exacerbate the situation. A 2017 study found that at least a third of new introductions of invasive species in the last 200 years have occurred since 1970. In the last three to five decades, the U.S. has suffered the impact of several invasive species. Burmese pythons have wreaked havoc in the Florida Everglades, reducing some native species by 99 percent since 1997. 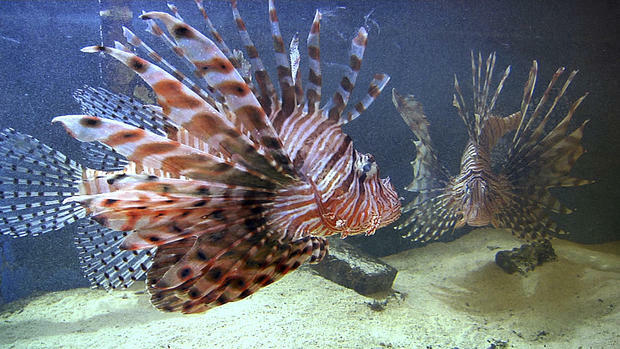 Lionfish have invaded reefs in the Bahamas, wiping out up 95 percent of native marine life in some areas. The beautiful but destructive fish has also spread through the Gulf of Mexico and nearly the entire length of North America’s Eastern Seaboard, the third largest reef system in the world. 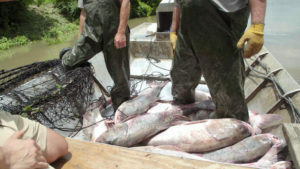 Asian carp, meanwhile, have effectively taken over the Mississippi River basin and are decimating local fishing industries. These insatiable giants were first imported in the 1970s to remove algae from ponds, but they were displaced by flooding and spilled out into the waterways, where they now crowd out favorites like catfish, shrimp and buffalo fish. Richard Durrett, a lifelong Louisiana-based commercial fisherman, says that for the last decade he’s been struggling to stay afloat. “I mean, when I was a younger guy we had probably 30, 32 local fishermen. We’re down to seven now,” he said. And because they didn’t evolve here, there’s no local predator to keep their numbers in check. Efforts to contain the problem include an underwater electric barrier built to keep them from entering the Great Lakes, where a $7 billion fishing industry is at risk. Until now, many invasive species have been limited in their spread because of environmental factors like temperature and humidity. But the prospect of climate change threatens to open up new territory for foreign flora and fauna to take over. Burmese pythons, for example, have thrived and multiplied in South Florida, where conditions are somewhat similar to their native Southeast Asia. But in 2012, a Burmese python was spotted as far north as southern Georgia. Experts fear that climate change could eventually enable these enormous snakes to migrate even farther north. It’s not just large or exotic animals that people are concerned about. An invasive species can be any kind of living organism, including insects, plants, fungi, even microorganisms like bacteria — raising alarm about the increased possibility of global pandemics that could sicken millions of people or decimate wholesale food supplies like livestock and produce. Invasive plants alone already cost $30 billion per year in eradication efforts, a number that’s likely to rise as climate conditions continue to shift. The growing season in the United States is already about two weeks longer than it was a century ago, allowing invasive plants to bloom earlier, sapping nutrients out of the soil and stealing an outsized share of the sunlight as they dwarf native species. While dealing with the impact of invasive species typically falls under the purview of local or regional authorities, combating climate change requires a worldwide effort. Virtually every nation in the world came together to sign the Paris climate agreement in 2015 aiming to curtail greenhouse gases and keep the average global temperature from climbing 2 degrees Celsius above pre-industrial levels. But in June 2017, President Trump announced that the United States was pulling out of the accord.